Liner Decoration on a 10 oz. liner. In 2016, we started purchasing 100% certified organic cotton to use as the core fabric for our canvas products. 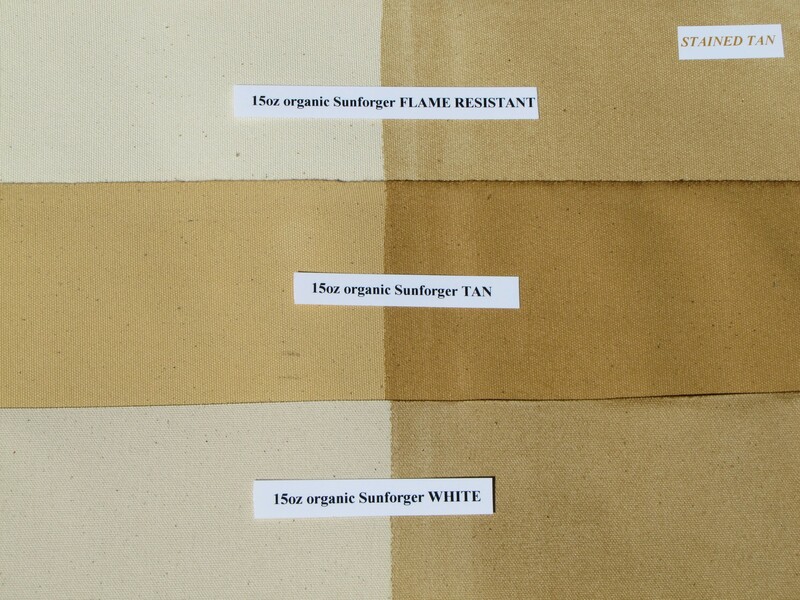 Since our tipi covers, liners, doors and all other cotton items are treated with the Sunforger® finish, though, we cannot claim that they are 100% organic products – and therefore we do not label them as 100% organic. Our choice to switch our entire product line to 100% certified organic cotton as our base fabric comes from our sense of responsibility towards people and the planet. Our commitment to buy organic will help the farmers in India with their health and their independency from companies such as Monsanto; it will reduce the amount of pesticides and fertilizers that are constantly poured into the Earth and it makes a statement against the proliferation of GMO being introduced into nature. This unnatural manipulation is unsustainable and, for instance, is responsible for 250.000 suicides among Indian farmers alone. To learn more about the impact of conventional cotton production, visit www.truecostmovie.com, and watch this eye opening documentary. While the switch to organic cotton makes our tipis a little bit more expensive, we made this change out of our commitment to be as environmentally responsible as possible in all our tipi making processes, and we encourage other tipi manufacturers to follow our example. All our fabrics are custom woven for us to our own specifications, and come from longstanding, trusted sources. We routinely have our fabrics tested to be certain that they meet our standards for strength, abrasion and tear resistance, and we will only accept 1st grade quality from our suppliers. We have been making teepees since 1970. 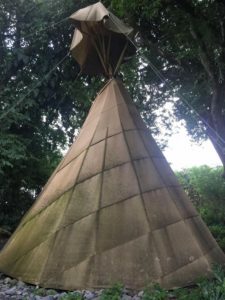 In those nearly five decades we have made more than 30,000 teepees, and we have sent them to over 35 countries around the world. We constantly seek feedback from our customers in all these locations with regard to the durability of our teepee fabrics. 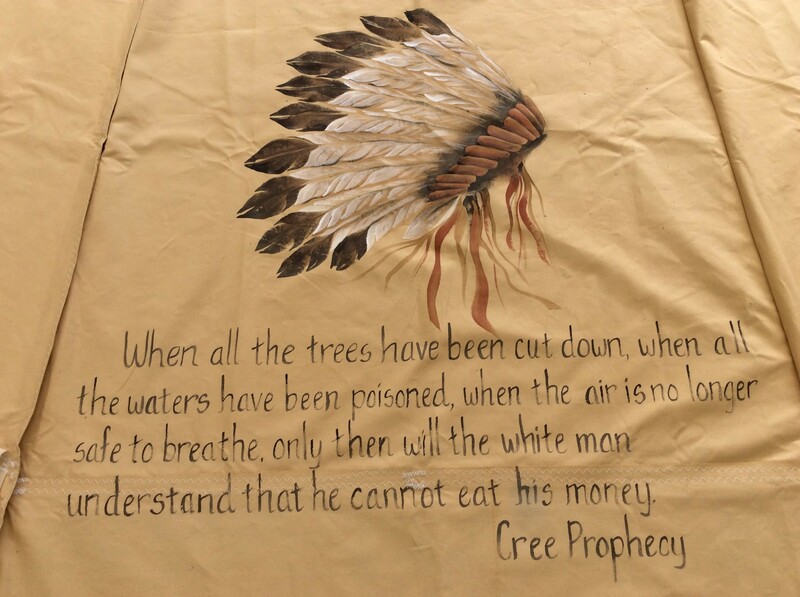 The responses that we receive can be summed up in one sentence: Ultra-violet radiation from the sun, increasing air pollution and proliferation of mold and mildew are the most destructive factors to the longevity of a teepee fabric. Unfortunately, these problems have not reached a leveling off point, and we cannot make predictions about the longevity of your canvas into the future. It ranges from 2 years to 8 years if left outside all year around. Jeb and Nicole with a 22ft. 15 oz. white tipi. As a response of these environmental changes we continue to research and test many of the cotton and synthetic blended fabrics that are on the market today. Unfortunately, all synthetics are petroleum based and therefore not very environmentally friendly. Also, the benzene ring molecule in all synthetics is far more susceptible to UV breakdown than are the natural cotton fibers. In addition, polyester blends are much more expensive, less breathable and not as translucent as 100% cotton. While cotton might not be the longest lasting material of all fabrics, we still consider it the best fabric for our product – especially as we use a very densely woven 15oz army duck canvas, that is woven to our own specifications. 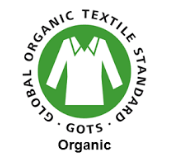 We also believe that the 100% certified organic cotton is a stronger fiber than the conventional cotton. The life of your tipi depends not only on the quality of the craftsmanship but in equal measure upon the quality of the cotton canvas that is chosen to make it. Unfortunately, untreated cotton, organic or not, does have little resistance against mold and mildew. 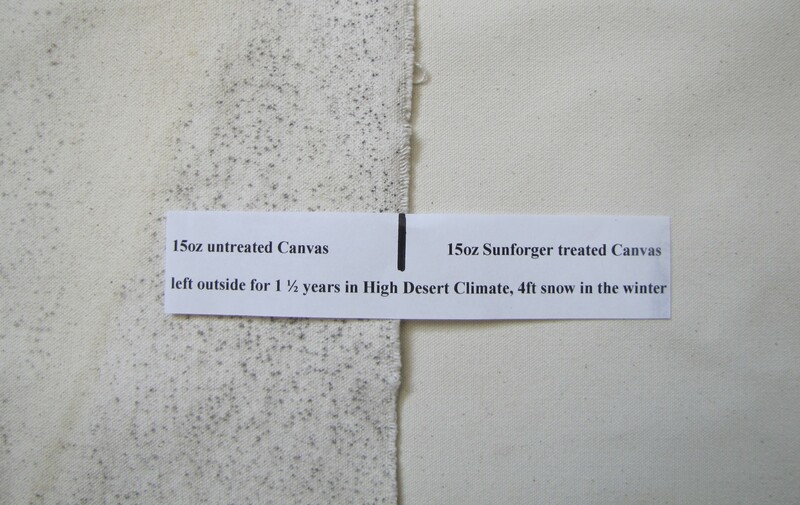 Our tests outside our shop, located in the high desert ‘dry’ climate of Central Oregon, show that untreated cotton molded after going through two winters with rain and snow, while Sunforger® treated cotton did not mold. All our fabrics are treated with a mold, mildew and water resistant finish called Sunforger®. After the raw cotton arrives from India, the finishing plant washes the cotton to pre-shrink it, then runs it through a bath of non-toxic chemicals in order to help the cotton fibers resist deterioration from the natural environment. In addition to this treatment, we add an extra Marine Resistant protective finish. Micro-crystalline paraffin (wax) is added in this process simply to help the fabric shed rain and snow. Please note that Sunforger® does not have a specific UV inhibitor in it. A third treatment is used to make some of our canvas flame resistant. All our flame resistant fabrics meet CPAI-84, a recognized specification for flame-resistant materials. 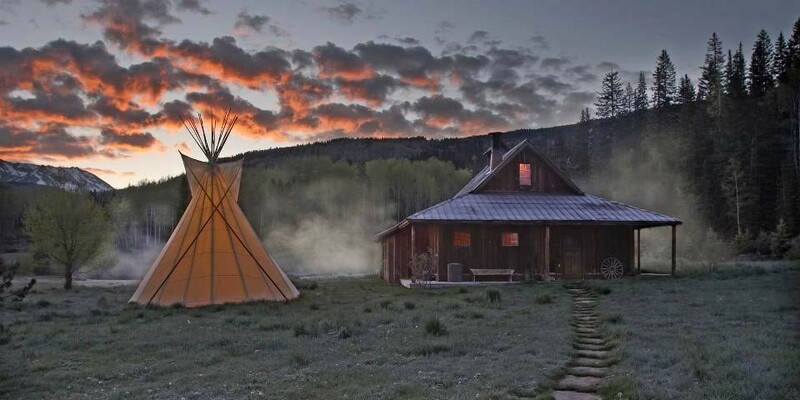 All public places such as campgrounds, retreat centers, airbnb’s, schools or events and festivals must have tipis made out of flame resistant fabric. 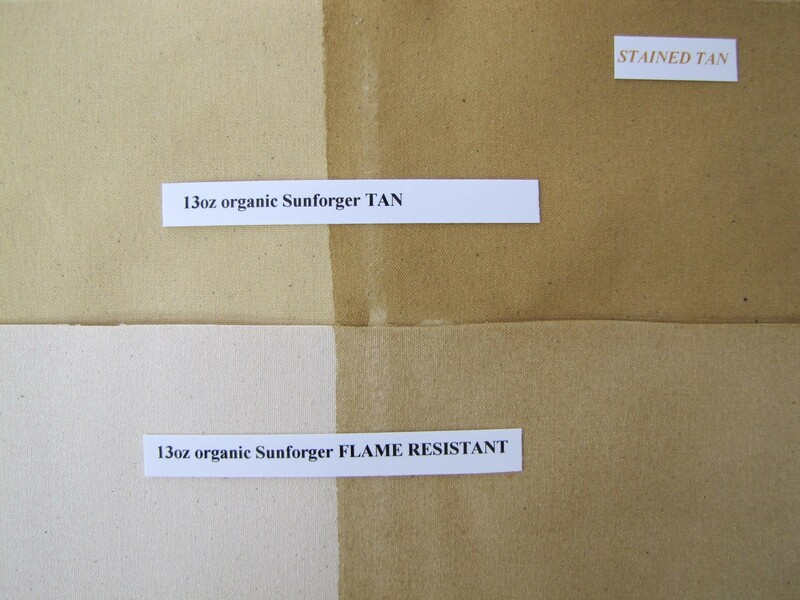 Untreated cotton vs. Sunforger® treated cotton. 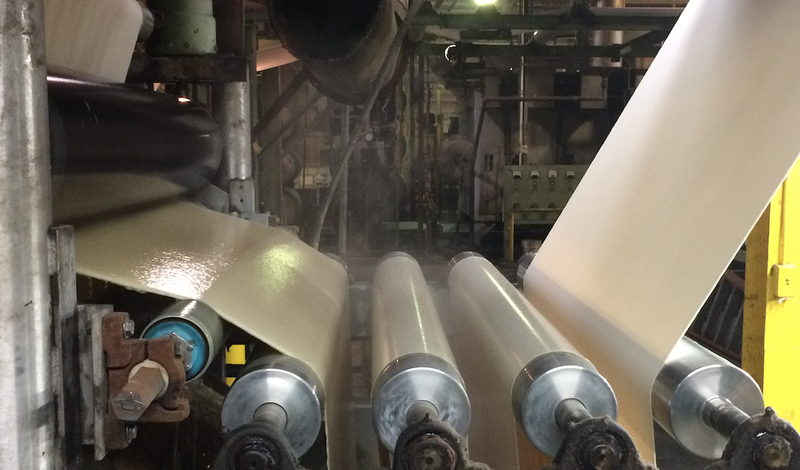 Untreated cotton is washed and bathed in a Sunforger® solution. Georgia, USA. Below you will find a detailed description of the different fabrics we offer, and our recommendation for their climatic and seasonal use. 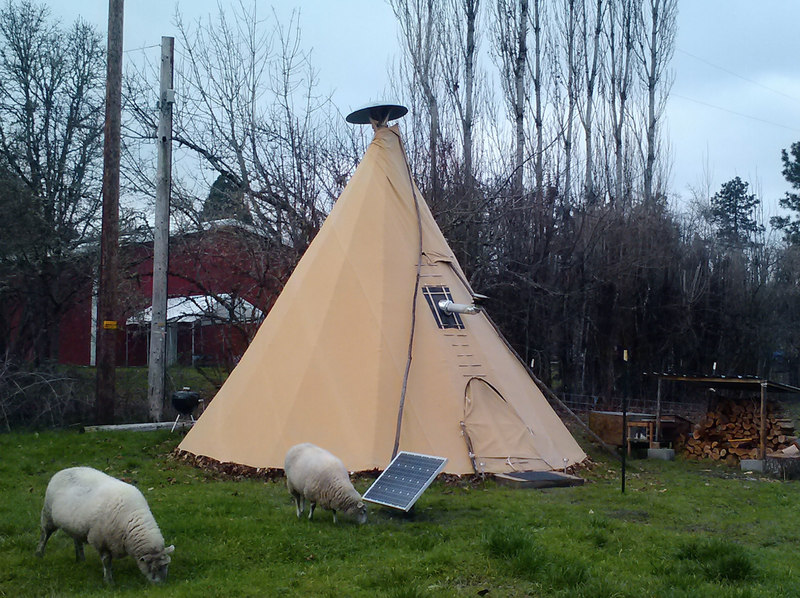 Please read “Care of your Tipi” before you purchase your tipi. 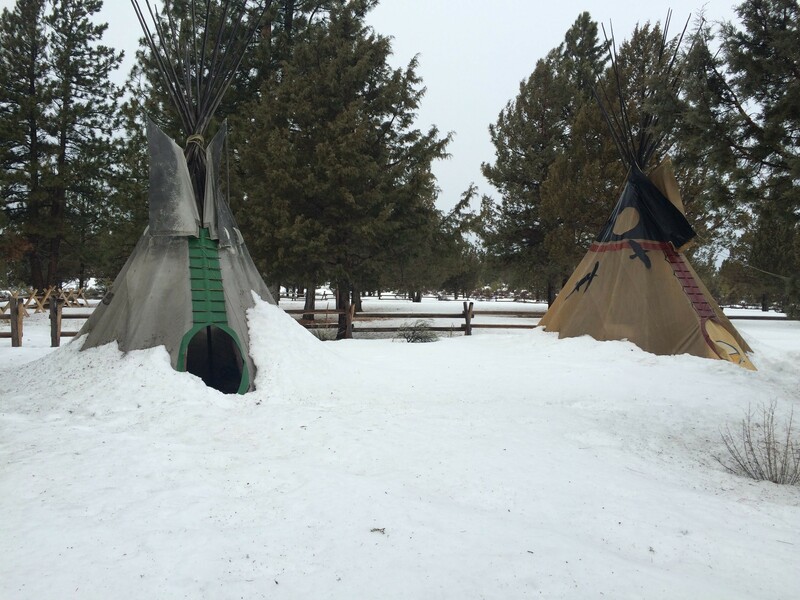 There are environmental circumstances that can affect the longevity of your tipi and this page explains how to take care of your cover in particular climate conditions. In certain climates, especially in hot and humid areas, we recommend the use of additional protective finishes even before you set up your tipi for the first time. The weight refers to the amount of organic cotton in one square yard. The heavier the fabric, the more organic cotton has been used to mill a yard, making the fabric denser and more water and tear resistant. Army duck refers to the tightness of the weave and the quality of the yarn that is used. Army duck is the preferred canvas for outdoor structures. 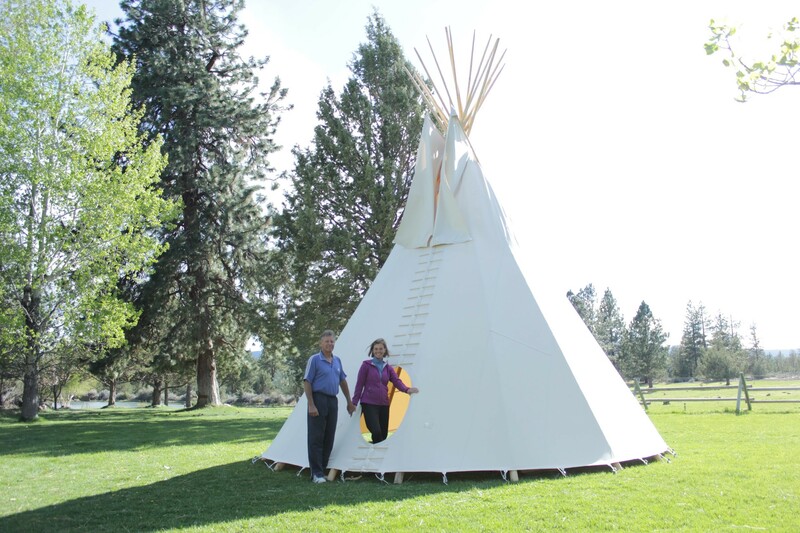 White has been the predominant tipi cover color and to date, most Native Americans prefer their tipis to be white. This keeps the tradition of their ancestors who made their tipis out of cotton which was introduced to them by the white man. Prior to the availability of cotton, though, tipis were made out of buffalo hides, which were tan in color. We started our tipi making project in 1970 with white canvas, but shortly after we introduced TAN as a second tipi cover color. Since then, we remain the only tipi company that offers tan tipis, so whenever you see one, you know it is a Nomadics tipi. 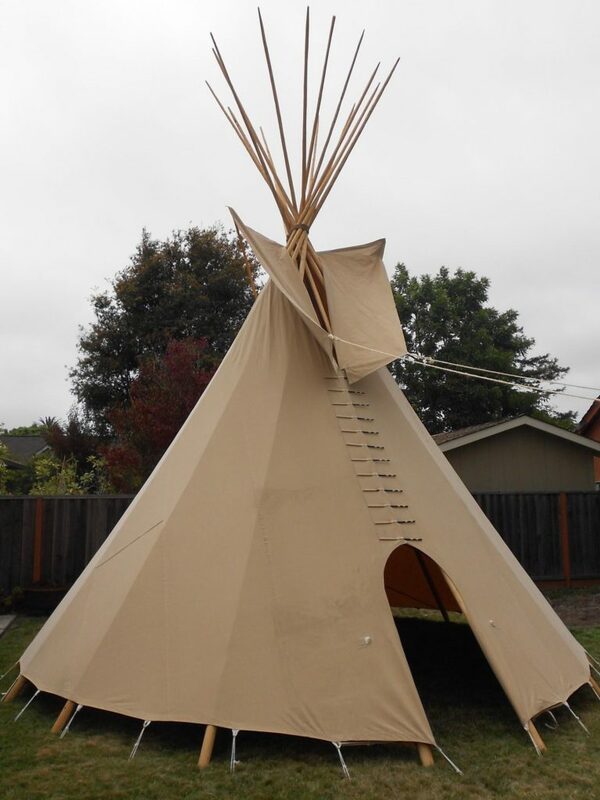 The beautiful light tan color resembles the original leather tipis of the Native Americans. 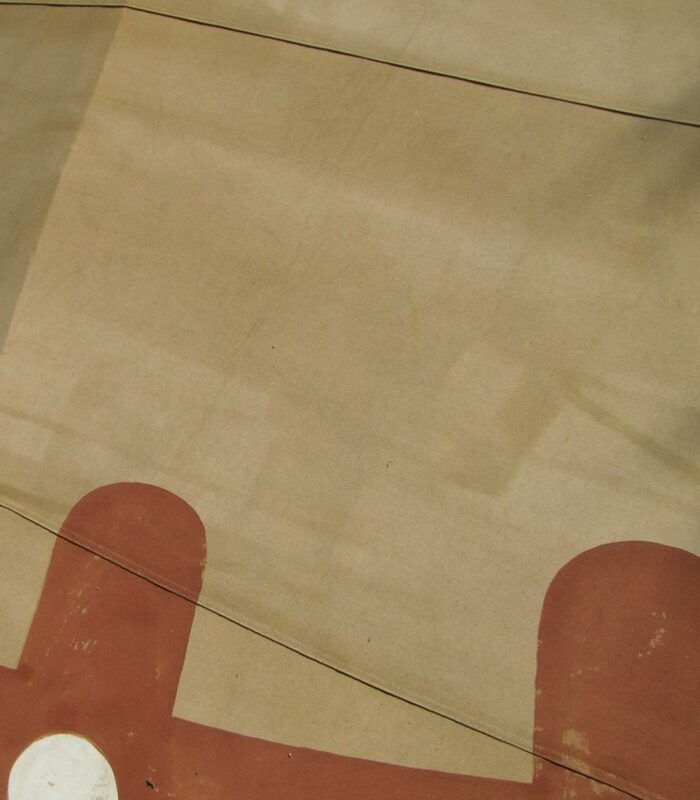 The tan fabric is completely translucent and creates a soft amber light quality inside the tipi. It also shows less dirt and ages much more gracefully than white canvas, which becomes grey with the years. Our 26ft white tipi, donated to the Standing Rock Sioux tribe in ND, Nov. 2016. Tan tipis have a beautiful glow if they are lit from inside. For an additional charge (e.g. $170 for a 20ft), we can stain any canvas with a beige colored wood preservative, which gives the fabric added protection and adds a beautiful patina of various shades of tan. As the flame resistant fabric only comes in white, some customer choose this option to give their tipi a more authentic ‘weathered’ leather look. Please note that we are rolling this stain onto the canvas, so roller marks are part of the “handmade” look. Close up of a flame resistant white tipi cover, stained tan. 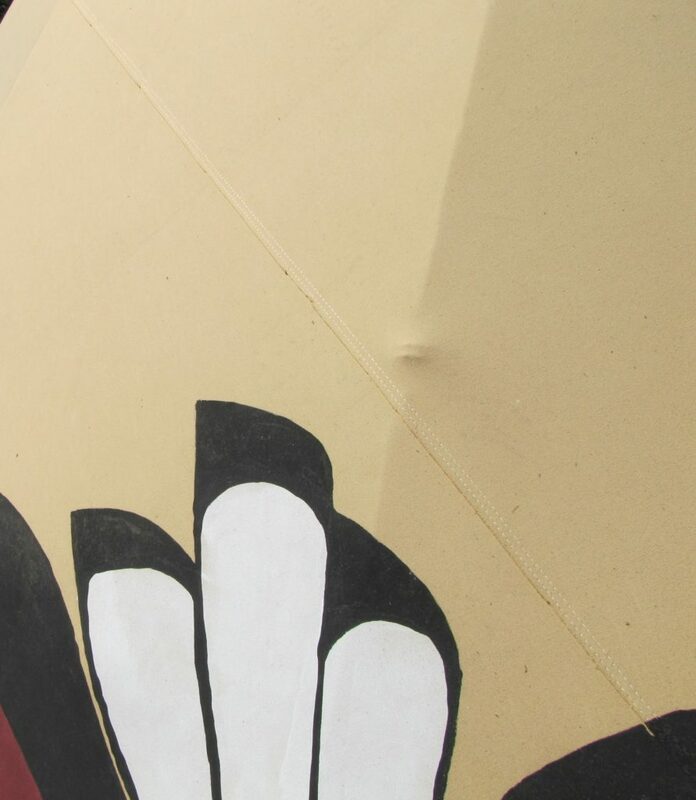 Close up of a tan tipi cover. This is the heaviest and most durable canvas fabric that we offer. We recommend it for year-around living in all environments and any elevation. 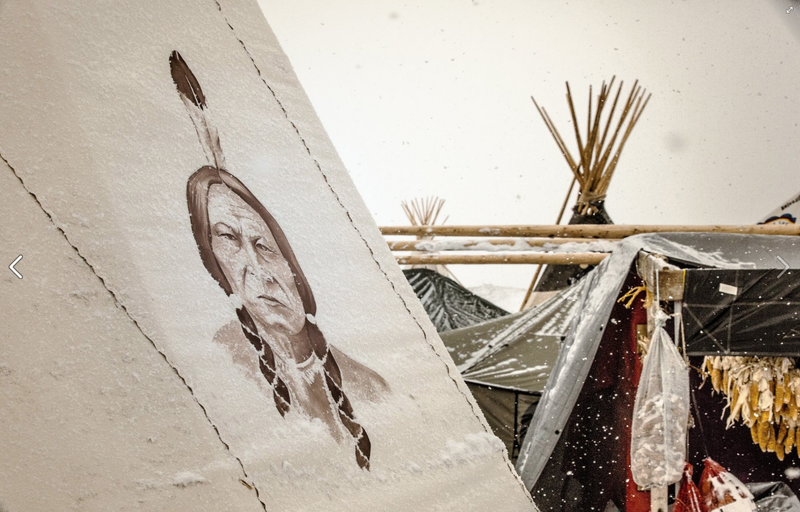 There are so many unique and unpredictable local climates that we cannot possibly tell you how long your teepee canvas will last. Generally though, this 15 oz. canvas should last five years or more if being used year around, and if our recommendations for the care of the canvas is followed. If it is taken down dry for the winter and stored properly, it should last eight to twelve years. This fabric is available in a natural cream white color with or without the flame retardant finish, or our light tan color (not flame retardant). All three 15 oz. fabrics and their look when stained tan. 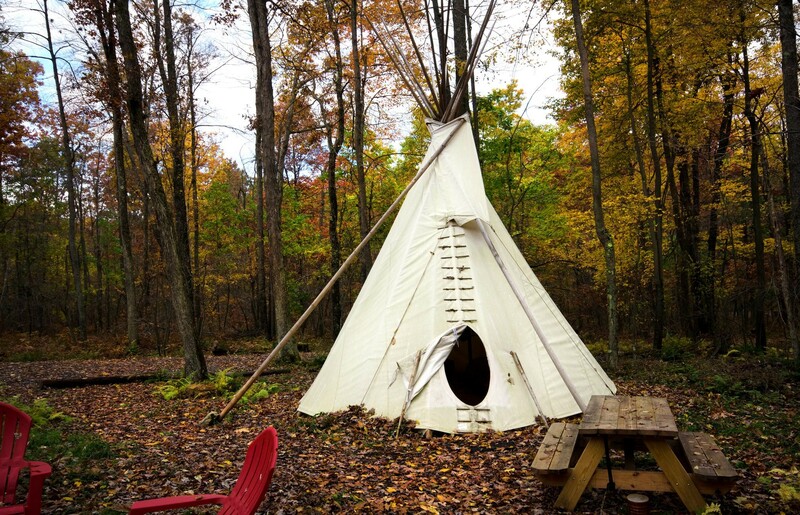 We recommend the white canvas for dry, open areas with high UV, the tan color works well in forest areas where tipis tend to get dirty quicker. The tan color looks more like a leather tipi and blends into the landscape well. 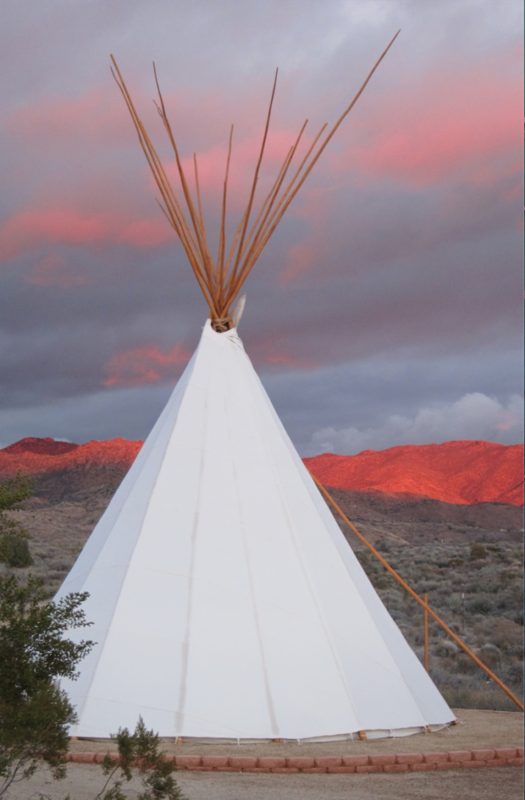 If the tipi is used as a rental facility or at camps, we highly suggest that you use the white flame retardant fabric. A 18ft. cover made out of this 15 oz. fabric weighs 57 lbs. (26 kg). 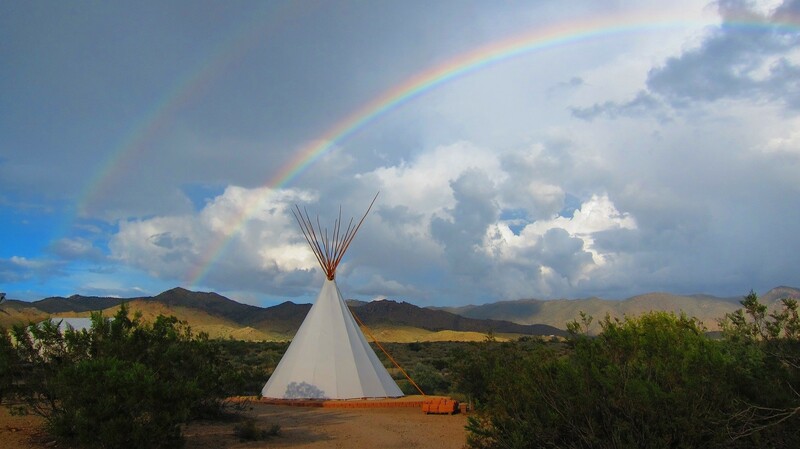 White tipis do well in arid or open spaces as well as in high elevation. Wooded, damp and wet locations are not ideal for the white canvas. A 15 oz. tan canvas chosen for year around tipi living. A 13 oz. tan summer hang-out. 13 oz. 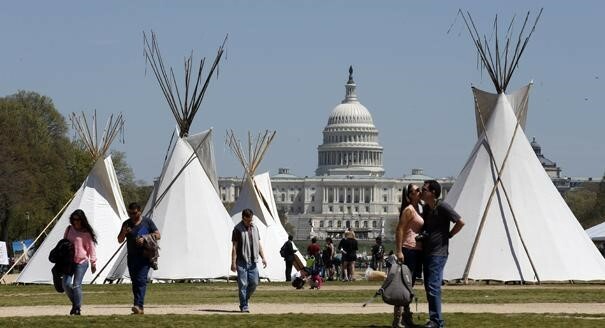 white tipis on The Mall, WA. The 13 oz. weight army duck canvas (actual weight is 12.65 oz.) 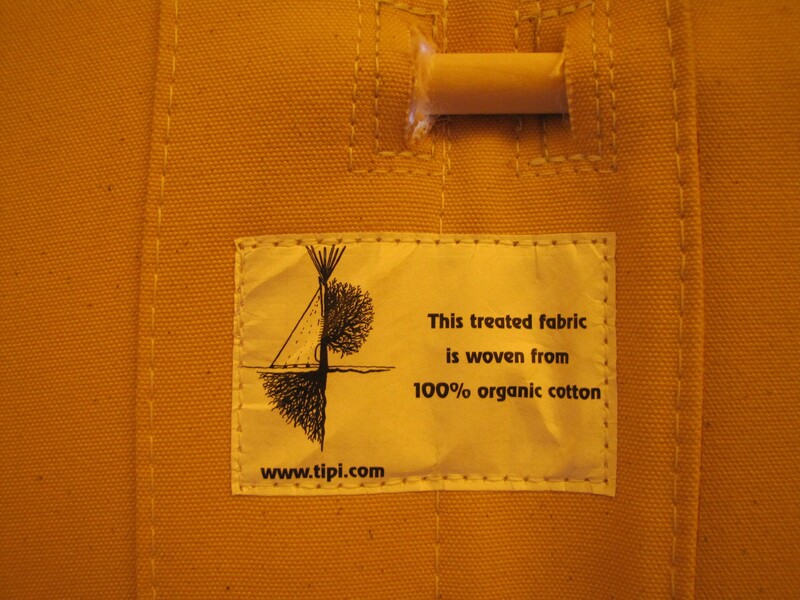 is a standard tipi cover fabric and many manufacturers only offer this weight. It is available in the color tan or in the flame retardant white. 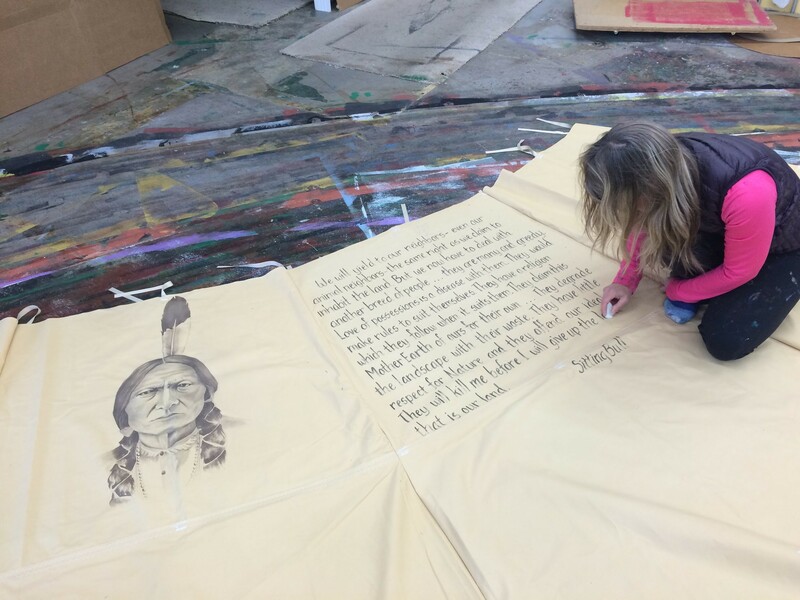 We also use the 13 oz flame retardant fabric for our kids tipis. We recommend this fabric when you plan to use your tipi only in the spring/summer/fall season or if you plan to travel with it. It is also a good fabric for festivals, events or ceremonies where you take down the tipi after its use. As with all our fabrics, this canvas is completely water resistant and will not leak in wet weather. If left up year around, the life expectancy of this 13 oz. fabric can vary from two to five years. An 18 ft. cover made out of the 13 oz. fabric weighs 52 lbs. (23 kg). Our two 13 oz. fabrics and their look when stained tan. We use this 10 oz. (10.38 oz. exactly) army duck canvas for our tipi liners. In our opinion, this canvas is not heavy enough to be used for tipi covers, although many manufacturers still offer 10 oz. tipi covers. The 10 oz. serves very well as a tipi liner fabric. It is available in the natural white color, the tan color or the flame retardant white canvas. Flame retardant is not always a necessity but may be a good precaution if children are using the tipi unsupervised, or if you plan to make a fire in a smaller size tipi. he ordered the same quote of Sitting Bull on his tan tipi liner. Although we made real leather tipis for the movie “Dances With Wolves” and “The Last Samurai”, we do not make leather tipis anymore.